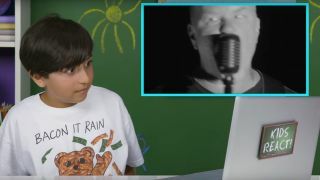 Metallica are the subject of the latest episode of the Kids React! web video series, as a group of children aged between 8 and 12 years old hear the thrash icons for the first time. Their reactions can be seen in the video below as they watch the video for latest track Hardwired. And while some are delighted and excited by what they see, others are less impressed. And Dominick, aged 8, just puts his head down on the desk in bewilderment. Meanwhile, Metallica drummer Lars Ulrich has offered another hint at what can be expected from the band’s 10th album, Hardwired… To Self-Destruct. He’s previously said that the feel for the album developed after the band performed 1983 debut Kill ‘Em All in full in 2013, leading them to re-examine their roots and settle on a more “punky” sound. Hardwired… To Self-Destruct is released on November 18. Metallica have announced a tour of Latin America in October, with more dates to be revealed for 2017.